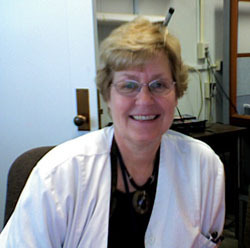 Dr. Barker-Griffith is the Director of the Ophthalmic Pathology Laboratory which provides primary and consultative services on ocular tissues in CNY. Expertise is available for processing and diagnosis of whole surgical or forensic case globes, corneal transplants, biopsy material from intraocular and extraocular sites, also cytology of conjunctiva and corneal inflammations. In addition, a 4 credit course is offered to medical students that includes weekly laboratory examination, study and diagnosis of new and teaching set surgical specimens as well as conjunctival and corneal scrapings. Students also learn how ocular structure and function are affected by the major ocular diseases. Clinical-pathologic correlation and therapy are emphasized. Students learn how to examine ocular specimens using both the dissecting and light microscope, and participate in the complete work-up of these pathologic cases. it is expected they will have a functional vocabulary of ophthalmic terms, a working knowledge of ocular anatomy and a rational approach to eye disease through the studies involved in this course. Second year Ophthalmology residents participate in the lab 2 days a week, to further their knowledge with gross and microscopic specimens, and help with teaching medical students. Often, a clinical research paper is finished. Dr. Barker-Griffith's research is supported by Research to Prevent Blindness, Lions District 20-Y1, and Lions International. She has collaborated with scientists at Harvard University, New York University, SUNY Buffalo, and Johns Hopkins University. Her work is published in Canadian Journal of Ophthalmology, Ophthalmology, Archives of Ophthalmology, and Archives of Pathology. She reviews manuscripts for Archives of Ophthalmology, Ophthalmology, and Ophthalmic Practice. She co-authored a chapter with Dr. Barbara Streeten on the Ciliary Body in Duane's Foundations of Clinical Ophthalmology, Tasman W., and Jaeger, EA, eds. She has received invitations to speak about her work at numerous institutions. Dr. Barker-Griffith participated in a re-certification field trial for the American Board of Ophthalmology. She is a member or fellow of the American Academy of Ophthalmology, Association for Research in Vision and Ophthalmology, Eastern Ophthalmic Pathology Society, The Verhoeff-Zimmerman Eye Pathology Society, Royal College of Surgeons of Canada, International Society of Aquatic Medicine, and American Association of Ophthalmic Pathologists. She serves on the Board of the latter two societies. She founded and directed the Southern Saskatchewan Low Vision Center, Canadian National Institute for the Blind. She also received the Award for Excellence in Neurology at graduation from Woman's Medical College of Pennsylvania, now known as Drexel University College of Medicine. Last Modified: April 05, 2018. Contact Carol Miller with questions about the content of this page.